Like I said in my Soccer Six article, I’m really not a football fan, but if my favourite artists are going to be playing and I have a chance of going – I’m not going to say no, am I? Monday 26th May saw Leicester City Football Club bursting at the seams with Directioners from across the country and Europe support 4/5 of One Direction as they headed out into the grounds for a football match against talk show host and former Britain’s Got Talent judge, Piers Morgan. Besides the One Direction boys, there were other famous faces such as Olly Murs, James Corden and John Bishop. The weather was cold, wet and windy, but as true and dedicated fans, Directioners came out in their thousands bundling with energy, support and a glimmer of hope of meeting the boys. There was no tension between either team but it was full of fun and banter. Niall pretending to kick Piers, Piers rubbing it in Niall’s face about his team scoring a goal, Harry pantsing Piers (or attempting at least) and James Corden running into Piers. It was, of course, just a load of fun and it was for a good cause, raising money for three charities; Irish Autism, Hearts and Minds and the LCFC Foundation. I’m not the most clued up person when it comes to football, but what I am aware of is that number 5 on Niall’s team (sorry, I didn’t catch who it was) came close to scoring so many goals – but failed. Also, someone on the opposing team pulled Harry about, thus causing him to do his little ballet move which had the crowd laughing. Very typical Harry Styles. What had us shocked, though, is when Harry scored a penalty and it melted my heart when he ran across the pitch (close to where I was – I did try not to fangirl, honest) and yelled “THAT WAS FOR YOU!” to Niall, who was the manager of his team but unfortunately couldn’t play due to a recent knee operation. 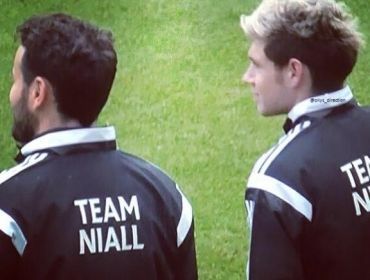 Team Niall sadly lost this game after the penalty shoot outs, but I’m still extremely proud of Niall and his team. They played very well and made fans’ hearts burst with pride! Even players I wasn’t so familiar with played so well and despite not being a supporter of Piers’ team, I will admit that they also played pretty well. Niall’s match managed to raise a whopping £300,000 which is absolutely amazing and will be split between the three charities. The overall event was a lot of fun and I highly enjoyed every moment. Rematch, Piers?